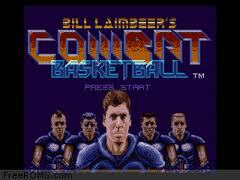 All games in tagged with "Bill Laimbeers Combat Basketball"
Bill Laimbeer's Combat Basketball is a futuristic basketball video game released in 1991 by Hudson Soft for the Super Nintendo Entertainment System. It was the first basketball game released for the SNES. The game stars Bill Laimbeer, who played for the Detroit Pistons of the NBA during a time when the team was notorious for aggressive and physical play. The game takes place in the year 2030. Bill Laimbeer has become commissioner of a basketball league, fired the referees and created a style of play without rules. There are no fouls and use of weapons is perfectly legal.